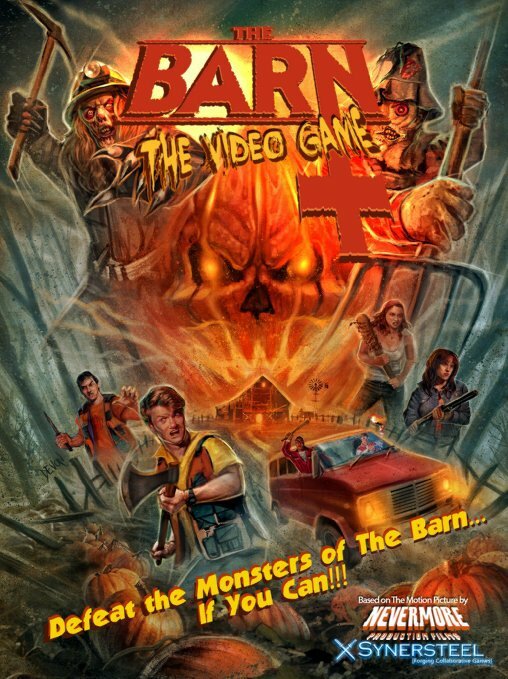 Back in July of last year, we brought you details on the independent retro Halloween horror film The Barn and an Indiegogo campaign to finish the film where one of the perks was a video game version of the movie, and now that game is available for you to download, and we have a brand new promotional video for it presented as a ’90s-style kids commercial. Keeping up with the retro marketing approach for ’80s-inspired throwback that is The Barn, the ’90s-inspired video game commercial features Stacey and Kevin (Ryan Nogy and Caden Holmes of The Barn) as well as Sam himself (Mitchell Musolino) as they unleash film’s villains Hallowed Jack, The Candycorn Scarecrow, and The Boogeyman through the video game system and into their living room. Created by Synersteel Studio, the game is now available on mobile for $4.99 on Android here and on iOS here. Special Limited Edition vintage Nintendo (NES) cartridges that are playable via PC (numbered and signed by the movie and game’s composer Rocky Gray; former member of the Grammy award winning goth/rock group Evanescence) are still available for purchase as a “Secret Perk” on Indiegogo only by clicking HERE. Game Description: Sam, Josh, Michelle, Russell, Chris, and Nikki are spending their Halloween night traveling back home from seeing the rock band Demon Inferno. Suddenly their van runs out of gas. Looking for help, the group stumbles upon an old abandoned barn. Knocking on the door unleashes the unforeseen evil inside. Once the smoke clears, most of the teens have vanished without a trace…except for Sam! You must now help restore the group by searching for them throughout the town of Wheary Falls and defeating the creatures of the night. The film’s official synopsis: It’s Halloween 1989, and best friends Sam and Josh are trying to enjoy what’s left of their final Devil’s Night before graduating high school. But trouble arises when the two pals and a group of friends take a detour on their way to a rock concert, finding an old abandoned barn and awakening the evil inside. Now it’s up to Sam and Josh to find a way to protect their friends and defeat the creatures that lurk within The Barn. Check out the game commercial in the player below, and then scroll down to view some images of the awesome retro packaging and NES cartridge, and player screens!